Sensible Support For Special Needs! Life Is Washable, Inc. partners with venues & organizations to bring “Friendly Access Sensory Safety Kits’ to their communities. Loud noises and bright lights can make it difficult or confusing for an individual with developmental disabilities or dementia to enjoy an event. Friendly @ccess kits are designed to support individuals of all ages, with a variety of sensory needs, and their families at events such as sports games, concerts and theater. Each kit includes an assortment of useful tools to help individuals enjoy an event with greater comfort. Kits also include identification in the event that an individual is separated from their family at the event. Venue staff is alerted and trained to the program, and can assist individuals in obtaining a kit or throughout the venue as needed. We work with each venue to customize a kit that works best for your fans and guest services/event staff and procedures. Kits are not intended to be “giveaways”, but are recognized as a valuable “aid kit” when your guests are in need. The kits are designed to be easily recyclable and economical for your organization. A venue can request kits for specific events and the information provided to the guest can be personalized or branded to the venue and event. If you are a venue wishing to partner with this program to provide kits, we would be happy to discuss with you, please contact us at jen@magicpaintbrushproject.org! Thank you to the San Jose Sharks & Stephanie Dubin for your support of the One Step Sharks Special Hockey team! We are so proud that you encourage and welcome fans of all abilities to enjoy the Sharks fantastic game day experience! We are grateful that you also support them with Friendly Access Sensory Safety Kits!These are more than a “Sensory Support” during home games in San Jose, they provide meaningful work for individuals with special needs in New York! Your impact reaches Coast to Coast! 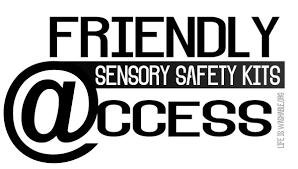 We are thrilled to announce that both the Florida Panthers & New York Islanders have welcomed the Friendly Access Sensory Safety Kits to their game plans for fan experience! So excited to support Dowd’s Crowd!! So proud to welcome fans of all abilities to the 2019 NHL All Star Games! Our in-game entertainment is great, but may be too much for some fans. SAP Center is now offering Friendly Access Sensory Safety Kits free of charge for fans with sensory needs. Thank you to Cincinnati Children's and the Cincinnati Cyclones for including all of your fans into your gameday! We are so proud to be a part of this!! Thank You to the Cincinnati Cyclones for making a great night possABLE! The Cincinnati Cyclones are hosting a Sensory Friendly game on October 20th! !